Amerks Addressing the Details; Jonas Johansson Called Up · Let's Go Amerks! The North Division is starting to tighten up, as expected, and another divisional game tonight for the Amerks gives them a chance to either extend their first place lead or allow yet another team to inch closer in the standings. Utica departed Rochester with a 5-4 win almost two weeks ago in what was considered a concerning and disappointing loss as a game they should’ve won. Over the last six games the Amerks have a 3-2-1 record, the Comets over the last six are at 4-2. Amerks are in first place with 28 points, Comets are currently in sixth with 22 points. Special teams are likely to play another role in this game as do in almost every game. The Comets are better at both with a power play of 24.5% to the Amerks 19.8%. Comets penalty kill is at 82.5% to the Amerks 78.6%. The ugliest number is the fact that the Amerks are 3/43 over the last 12 games on the power play. Rochester has a 2-1 record in three games against Utica this season and has outscored them 14-6 in those games. Recent numbers may sound depressing but this is a team, like all teams, the Amerks are capable of beating to get back on a winning streak. Last weekend in two games the Amerks only goal was from Victor Olofsson. In the previous three games they had scored 12 goals. Goaltender Jonas Johansson was called up from Cincinnati to Rochester this week which came as a surprise. Scott Wedgewood and Adam Wilcox are both at 100% health and capable of playing. Johansson had said it was a welcome surprise to him and he was immediately on a plane and in Rochester for practices. The move wasn’t made as a way of sending a message to Wedgewood or Wilcox that they are at risk of losing games. The coaching staff and management wanted to get him a high level of practice to see where he’s at right now. The organization continues to stress internal competition and making sure everybody is on their toes. There are no plans for additional moves from Cincinnati any time soon at other positions to try and spark some offense. Tyler Randell and Yannick Veilleux have been extras looking for more playing time, there’s extra defensemen, and Kyle Criscuolo is expected back within two weeks. Andrew Oglevie is currently on the day to day injured list. Paetsch won’t be playing in two straight though. Matt Tennyson was assigned back to the Amerks this morning and is expected right back into the lineup. Jack Dougherty will be the other extra defenseman with Brand Hickey set to also play. Andrew Oglevie is likely to be out of the lineup for the second straight game after being banged up last Friday. Look for Scott Wedgewood to get the start with Johansson backing him up. 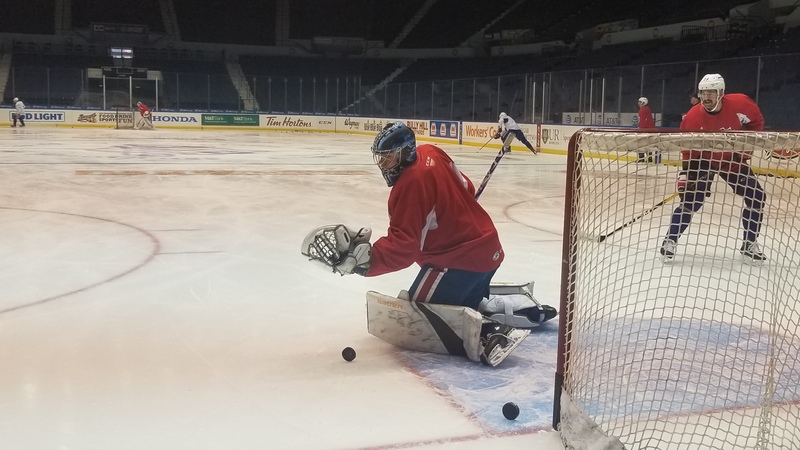 Update: Don Stevens mentioned on The Sports Bar ESPN Rochester 95.7FM that Jonas Johansson will get the start tonight. Sounds like a message is being sent. Amerks have three games this week starting tonight vs Utica (which will be on MSG as the first of three televised games), Friday at home vs Providence, and on the road in Syracuse on Saturday.